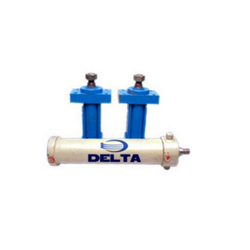 Our range of Hydraulic Cylinders and Precision Hydraulic Cylinders are in conformity with international quality standard and is offered under the brand name “DELTA”. The honed tubes used in the cylinder are micro finished for Ra value of less than 0.3 microns. Further, the imported honed tubes can also be fitted in the cylinder as per the preference of our clients. Our grounded and hard chrome plated piston rods ensures longer and smooth operation of the cylinder in adverse conditions.